Among the side dishes for Chappathi green peas curry is one among them.Its healthy as well as easy to prepare it.This curry is without adding coconut.I have used dried ones so can prepare even during non season. Soak dried green peas overnight. Add ginger garlic paste to it. Fry a little. Add chopped onions to it fry for sometime then add tomatoes to it and cook till mushy. Now add soaked green peas,chilly powder,coriander powder,turmeric powder,salt and enough water to cook the green peas. Mix well and keep for 2 whistles. While serving add chopped coriander leaves. Can serve with Chappathi,Roti or Appam. 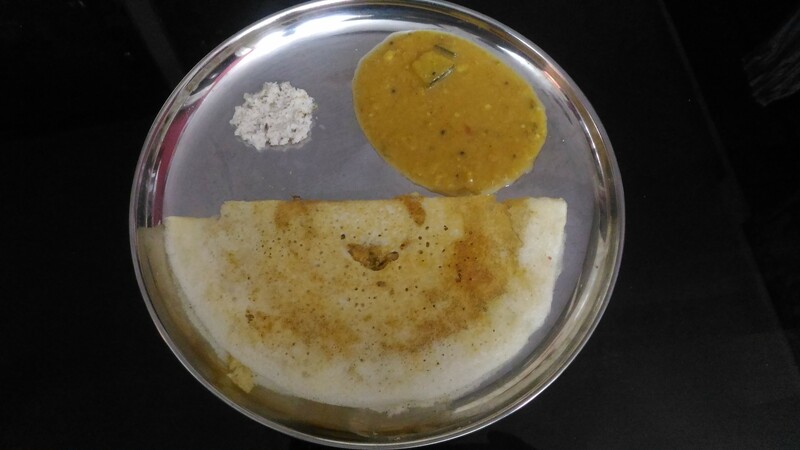 Gopi masala dosai or cauliflower masala dosai is another dosa variety from my cuisine.This is an all time favourite for my family members.Can easily prepare this curry.If curry is left over can use it for rotis or Chappathi as a side dish.Two steps are involved one is preparing the curry and second is stuffing the curry in the dosa. Green chillies_2chopped or can use chilly powder instead. Vegetable masala powder 1tsp/ or Sambhar powder 1 tsp. Cashew nut paste or coconut paste 1to 2 tbs. If you are going to add cashew paste soak in hot water and grind it into paste. and keep aside. Chop cauliflower boil and keep aside. In a wok put oil and add mustard seeds and when it splutters add urad dhal. Now add ginger and garlic paste and fry. Now add onions ,green chillies curry leaves and saute it. Add chopped tomatoes to it and fry till it becomes mushy. Add cashew paste or coconut paste. Add coconut paste or cashew paste to get it thickened.Finally add chopped coriander leaves. Keep Dosa tawa and put one laddle of dough on itSpread into a round shapes one. Drizzle oil or ghee on it . When it is cooked and crispy keep a spoonful of masala in one side of the dosa cover with lid for few seconds.Then cover it with the other half.After few seconds remove from fire.